I'm trying to connect to my corporate VPN using a laptop running Ubuntu 10.04. It's a company laptop but as I have chosen to run Linux rather than "a proper" OS, I'm mostly on-my-own as far as getting these things working. Normally that's OK because I am almost always successful - except this problem has had me stumped for several weeks now. The problem is that I am unable to access the VPN from my home network. I am using the Gnome Network Manager interface to configure the PPTP connection but no matter what combination of options, domain\username formats, encryption options or authentication methods I select, I get the exact same behaviour, which is essentially a 10-second wait, and then a failure message. Aug 15 22:27:50 pc770-ubu NetworkManager: <info>  VPN connection 'VPN' (Connect) reply received. Aug 15 22:27:50 pc770-ubu NetworkManager:    SCPlugin-Ifupdown: device added (path: /sys/devices/virtual/net/ppp0, iface: ppp0): no ifupdown configuration found. Aug 15 22:27:50 pc770-ubu pptp: nm-pptp-service-4595 log[ctrlp_disp:pptp_ctrl.c:773]: Client connection established. Aug 15 22:27:51 pc770-ubu pptp: nm-pptp-service-4595 log[ctrlp_disp:pptp_ctrl.c:858]: Received Outgoing Call Reply. Aug 15 22:27:51 pc770-ubu pptp: nm-pptp-service-4595 log[ctrlp_disp:pptp_ctrl.c:897]: Outgoing call established (call ID 0, peer's call ID 17382). Aug 15 22:28:21 pc770-ubu NetworkManager: <WARN>  connection_state_changed(): Could not process the request because no VPN connection was active. I ran Wireshark to watch the traffic and it seems that no LCP replies are coming back to the client. the laptop is connecting to the Internet via a WiFi access point (bridge mode), then an ADSL router. PPTP pass-through is enabled on the ADSL router and Access Point. if I connect the laptop to the ADSL with an ethernet cable (to eliminate the WiFi), there is no improvement. another laptop (running Mac OSX) is able to connect to the VPN, via WiFi or cable. another client, Windows7, is able to connect to the VPN via cable. an iPhone is able to connect to the VPN via WiFi. this laptop is able to connect to the VPN from inside the corporate firewall. So I've got three other devices that are able to connect to the target PPTP VPN, and a laptop that can't, except when I move the laptop inside the target network, it can connect. Any ideas what else I can try? I've tried methodically selecting various VPN options with no change in result. I've also read several Ubuntu Forum posts suggesting turning off EAP and that doesn't help either. I'm now at a loss how to fix this, and what will happen next is I'll be told by Management "we told you so", drop Linux and switch to a "proper" OS like Windows instead, which I really don't want to do. Never found a solution - switched to OpenVPN instead and that works fine. I was experiencing the same problem and I think I have it solved. I had checked off "Use this connection only for resources on its network" (click Routes on the IPv4 Settings tab). Once I removed this option, my connection was able to tunnel into my VPN. 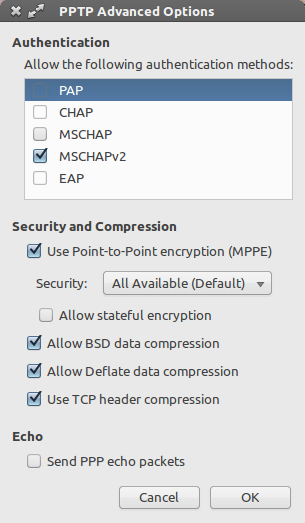 My settings are as follows in the PPTP Advanced Options screen... All authentication options unchecked with the exception of MSCHAPv2. I hope that ends up working for you and that you are able to keep your Ubuntu installation! I'm running Ubuntu 10.04, I have setup 2 VPN connections one to my office and on to my client's office. The connection to my office don't work but the connection to my Client's office does. I believe the problem is on the Microsoft Server. This post and my own observations support this conclusion. Finally I realized that I had checked the GRE/PPTP box under Tracking/NAT helpers (in Tomato WebGUI, go to Advanced->Conntrack/Netfilter, then scroll down to Tracking/NAT helpers) but the default state was unchecked. So I unchecked it, and VPN started working again! I have the same issues with my company laptop. I've been using Debian Lenny for about a year. I get around those Linux limitations by running Microsoft Windows in a VirtualBox VM. I can VPN into our corporate office inside the VM. That lets me access the corporate network from inside the VM, but not from the Linux host. Not the answer you're looking for? Browse other questions tagged linux ubuntu-10.04 vpn pptp or ask your own question.